I’ll be back in a day or two with more thought-provoking blog posts. In the meantime, since it’s the weekend, I figured I’d share with you a few things I am working on and reading that wouldn’t necessarily fit in an entire blog post — including some fun I’m having! Actually, you might be surprised to find out that I became a believer after consistently envisioning for several months that I would sell my business for $1 million, and then doing it. I’ll explain how I did it in another blog post. In the meantime, since I’ve achieved that goal, and am working hard toward my $10,000/month in writing and blogging income by the end of 2008, I decided to envision something more fun. I noticed on the Abraham/Hicks website that they were taking a cruise to Tahiti next year. I was disappointed to find out, however, that the cruise was sold out and the wait list was closed. I used a bit of intuition to figure out how to get on the wait list even though it was closed. Then, I figured I’d have a bit of fun. 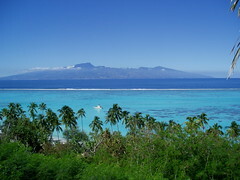 Every day, I close my eyes and imagine myself on a cruise to Tahiti. I also taped up a picture of Tahiti next to my monitor on my desk. I will be taking a cruise to Tahiti. I won’t guarantee that it will be that cruise, but I figured I’d let the Law of Attraction do its thing. I’m not pushing to get on the cruise. I haven’t booked plane tickets, I haven’t surfed other cruise websites, and I’m not doing my typical research on the location. I’m simply envisioning being there every day, and what it will feel like, and how glorious it will be. Having done this for a few days now, I’m starting to see small “echoes” of cruises showing up in my life. For those of you who are into the Law of Attraction, you should recognize this as the recognition that my thoughts are having an effect. I’m sure at this point that some of you will think I’m absolutely nuts. But for me, this is an important experiment. I push hard to make the things I want happen. What if I don’t really need to push so hard? What if all I really need to do is truly become in alignment with those things and then act on my intuition when it is appropriate? This thought experiment may show me a much easier way of achieving my goals. I’ll keep you posted. Either way, I’m having a blast doing this. I recently completed several more interviews, including one with Steve Pavlina, where he shares how he created a blog with over $40,000/month in income and millions of visitors per month. As soon as I have the transcriptions of these interviews, I will be posting them here. The Steve Pavlina interview will be free; others will be part of Inspiring Innovators. I plan to launch Inspiring Innovators next month. Initially, there will be a monthly fee of $18 for access to 2 interviews per month with successful entrepreneurs and a community forum for all members to share experiences and network. Later, there will be an additional premium membership, which will be a way for you to get consulting directly with me about how to grow your business. Once I launch Inspiring Innovators, I’ll keep you in the loop about how the business is going and what interviews I have available. Like me, I have a feeling you will find many of these stories inspirational! Jamie Harrop interviewed me, and then compiled my interview, along with interviews of 9 other interesting bloggers, into a free ebook. The ebook gives insight on how to grow your blog to thousands of subscribers. Thanks for thinking of me for this series, Jamie! Cath Lawson, whom I found out about when Jamie interviewed her, seems to be my long-lost twin. 😉 She also started a successful business and is now running a blog talking about her business experiences. If you enjoy my blog posts, you may like hers, too! Roy Leban is on a mission to build a web startup in 30 days. He’s blogging about the startup and his challenges and goals. For those of you who wonder what it’s like to build a web-facing startup company, Roy gives great insight. Derek Halpern made a 6-figure income from blogging in 2007. He ran several celebrity/pop culture blogs, and is now blogging about what it takes to be successful in business. Brian Armstrong wrote a book called “Breaking Free” on how to start your own business, and is also blogging about how to start a business. Christine OKelly recently came back from a long blogging hiatus to share more of her story. She took the plunge and started a business when she had 2 kids and no savings, and it hasn’t always been an easy road, but she blogs with a refreshing honesty. Thanks for the shout out Erica, and I’m sure you’ll reach your $10k/month goal! Keep goin. I am also a fan of Jerry and Esther Hicks and have used the Law of Attraction, Creative Visualization (and actions) to manifest what I want. I’ve not been as consistent of recent but it’s been on my mind that I should be – and get back to basics on that one. Your post has nudged me in that direction. I look forward to hearing the announcement that you’ve gone on your Tahiti trip and met your goals. Hi Erica – Thanks for the mention and for calling me your twin – even though I’m old – 39. My next business will be my fourth. I gave up one, sold one and sank one. Hopefully there will be no more sinking businesses. I love this experiment. I just read Ask and It Is Given by Esther & Jerry and it is brilliant. I’ve always believed in the Law of Attraction since reading Think and Grow Rich, so I don’t think you’re mad. It would be great if you get to go on the cruise. My daughter put a picture of Italy on the dream board and less than 2 weeks later she got the chance to go on a school trip there. It works. And it sounds like you’re well on your way to achieving your target. Tell me more about the interview you sold though – who was it with and how did you sell it? By the way, I joined the Steve Pavlina forum that you mentioned and I tried to put you down as the referrer but it wouldn’t work as I didn’t know your username. I’m really looking forward to your interview with him. It’s good to hear Christine is back – I had removed her from my reader, as I thought she’d gone forever. Sorry Christine. I did a similar thing to what you’re doing for Tahiti when I went to Chicago. That year (2007), my main goal was to make it to the US for 10 days of conferences and fun with Paul in Ohio. For the six months building up to the trip, I had a stunning image of Chicago at night as my desktop background. It was nice to wake up to that each morning to remind me of what I was working for. @Cath – 39 is not old. 😉 I will definitely explain more about the interview and how I sold it — although I may make that part of Inspiring Innovators. My username on the Steve Pavlina forum is ericabiz. You’ll definitely enjoy your time there! Hi Erica – thanks. Inspiring Innovators sounds worth joining if you’re going to share that sort of info. Will let Steve’s forum know you referred me. I’m in Budapest enjoying some Hungarian beer and potato pancakes with sour cream. I have a stunning view of the Parliament Building framed in my window while a black and white slide show plays at its base. The slides are commemorating the anniversary of the 1956 uprising against communism. And then I’m off to Prague shortly. I always manifest trips. Back when I was a video editor (the days before I became a travel writer), I went to Europe right after quitting my staff job, never really worrying about paying the bill. I just knew it would work out and I just knew I’d have the work when I returned. When I got home I had enough freelance work fall into my lap that I paid my travel bill, rent, and had enough left over to live decently for the rest of the month. To really put power behind your desires takes more than just visualizing, though. You have to live your life as if you were going/are there. As if you already have the money and are shopping for that new Tahiti bathing suit and making a list of what to pack. You’re making plans and talking about it and tying up lose ends and scheduling the time off. It’s about action and faith, not just visualization. Writing and being open is a very good exercise for the soul. Thank you for sharing. Experience Harmony. Just wanted to know if you ever got that cruise to Tahiti….do tell! Every body acknowledges that life seems to be very expensive, nevertheless we need money for different issues and not every man earns enough cash. Therefore to receive some loans or just term loan will be a right solution.